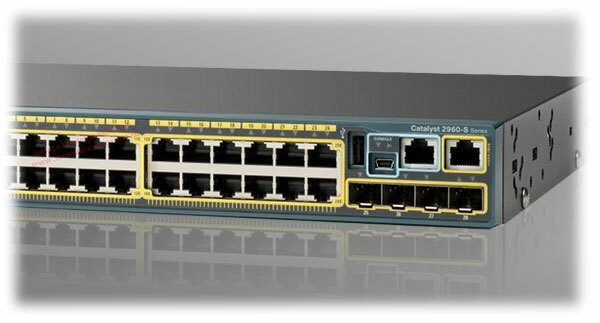 The Cisco Catalyst 2960 Series WS-C2960S-24PS-L is a 24 Ethernet port, 4 SFP, LAN Base switch with PoE. · Ethernet Port: Port used with RJ-45 connectors. It is the “go to” networking port found on laptops, desktops, servers, printers, gaming consoles, etc. · SFP: Small form-factor pluggable transceiver (transmitter and receiver). Similar to the previous generation GBIC, but considerably smaller. Used for data communication, telecommunication, SAN, etc. The SFP makes for easy upgrades or repair since they are hot-swappable, meaning they can be replaced while the hardware is in use as opposed to removing circuit boards with modules soldered in place. · LAN Base: A Cisco license for layer 2 access switches that is a step up from the free Lan Lite. It offers VTPv3, FlexLinks, Ingress policing, Trust Boundary, AutoQoS, DSCP mapping and more. The majority of our customers request the LAN Base version of Cisco switches. · PoE: Power Over Ethernet means devices plugged in to the RJ-45 ethernet port can be powered from the port as opposed to being plugged into a wall socket. In the case of the WS-C2960S-24PS-L, power can be drawn from a maximum of 12 ports at a maximum of 30 watts each. Total available PoE is 370 watts for this switch. The WS-C2960S-24PS-L is the best-selling Cisco Catalyst 2960 Series switch at Maximum Midrange because it offers all of the software and hardware needed in a small to medium sized business networking environment with opportunity for future expansion with stacking. The stacking is provided by Cisco’s FlexStack hot pluggable module that allows up to four of these switches to be connected together and acting as one. Customers that are looking for more ports and don’t need PoE, usually move up to the WS-C2960S-48TS-L for a minimal cost increase and customers happy with the 24 ports, but don’t need PoE move down to the WS-C2960S-24TS-L.
Pricing on the WS-C2960S-24PS-L is close to the middle of the pack for the LAN Base Catalyst 2960 switches and refurbished units are considerably less than the MSRP.